FREE! Magazine » Looks like a foreigner… let´s stop him at the Finnish border again! A few days ago, I woke up early after an exhausting week of hard work in Vantaa to catch the Eckero Line ferry at 8:00 that would bring me back to Estonia. During the last years, I have travelled by ferry dozens of times between Estonia and Finland, due to studies, works and personal relations. So I handled my ticket to the checker at the ferry terminal… and here we go again! A (I must say that at least she was polite) security woman leads me to one side to proceed to a “random” security check of my luggage. After passing my back bag three times through the scanner, she makes me open it to discover that the biggest threat there is my bottle opener that I carry together with my keys. I am still wondering what they really wanted to find from a foreigner crossing the border early in the morning from Finland to Estonia. If I would like to smuggle something, certainly I would have more chances to other way around from Estonia. But the point is that for me, this is not an isolated case. In the recent years, this is the third time that has happened to me, and always on the Finnish side of the border. I have never had any problem with security forces in Estonia so far. 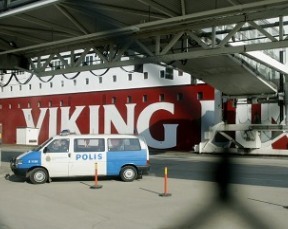 But added to this fact I narrate, a couple of years ago, while coming to Finland by Viking Line being an exchange student in the Baltic neighbor, the policemen also stopped me twice to check my luggage with no apparent reason. The funniest thing is that when they stopped me, I was just trying not to crash in the corridor with the hordes of drunken people around. It must be that if you are not blonde and you are sober, you must be a dangerous terrorist. And it was even more curious that as far as I switched the conversational language to Finnish to explain that I have lived for a few years in Finland, they let me go without even opening my bag. I am sure that the Finnish security forces carry on with an excellent job, but as a foreigner, I must confess that I never feel at ease near them in Finland. While in Spain I consider them like usually helpful, and in Estonia I just ignore their presence, every time they are close to me in Finland, I feel like if I would be their target and the red light of danger switches on in my head. And I think that my feeling is shared by a sector of Finland´s foreign population. If you get involved in a problem with Finnish people and police appears, be sure that in most of the cases you are going to take the worst of it.